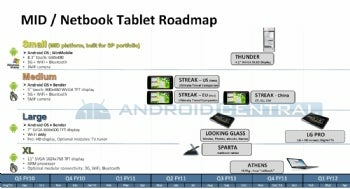 Hot on the heels of last week's Dell Streak leak, Android Central claims to have obtained Dell's "roadmap" for tablet releases, which shows not only the Streak tablet and the Lightning/Thunder/Smoke/Flash quartet of smartphones, but also two new netbooks, "Sparta" and "Athens". Sparta is a "netbook tablet", while Athens weighs in at less than 2 pounds as a "true" tablet netbook. Both these devices have ARM processors, 11-inch touchscreens, and optional Bluetooth, 3G, and WiFi. The 7-inch Looking Glass (with wireless, Bluetooth, and a camera) is also on the roadmap, along with a Looking Glass Pro with an HD screen and digital TV capability. When will these devices arrive in the US? The roadmap seems to indicate that Sparta and Looking Glass will hit stores sometime around August, and that Athens will follow shortly after that--so you'll probably have to wait until August to grab the tablet off the shelf and scream, "This... is... Sparta!"